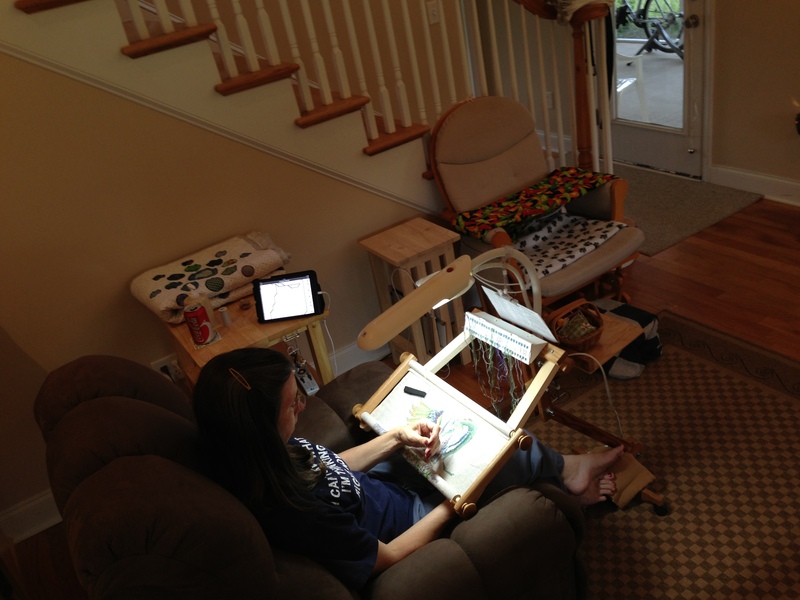 I have renewed my passion for cross stitch once again and a few weeks ago I decided that I to get serious about my hand work I really needed a good working frame system. I have had a scroll frame system for many years and it works well, however, I have always wanted a floor stand that works. The one(s) I have had my eye on are way beyond my price range, around $300, plus shipping. Enter creativity and resourcefulness. A few years ago, a distant relative gave me a (somewhat) homemade floor stand. When I originally tried to use it, the frame was quite rickety and unstable. The two board strips that were supposed to hold the scroll frame could never be tightened enough to keep the frame from slowly tilting down toward the ground. So, I fixed it. First, I cut two strips of wood and drilled holes in each end of them. Into the hole on one end I glued a 2″ long dowel. The other end of each strip I bolted into the original stand where the scroll frame used to be pinched. This created a platform that I could rest my scroll frame on and made it much easier to flip the frame for working on the back and such. Next, I drilled a hole through each joint and inserted a long bolt. This provided the joints with stability and kept the frame from collapsing. Finally, I drilled holes in the bottom and attached casters. This makes it easier to move around. I attached my daylight lamp and Viola, my new frame works like a dream!! I am so happy with it. I have been using it a few weeks now and just love it. Nothing like “saving” $300 to make a girl smile. What do you think? Remember this cross stitch project? Yep, you guessed it, I am back to working on it again. This time, though, you are probably going to get tired of seeing it because I am going to keep posting progress photos of it till it is finished. 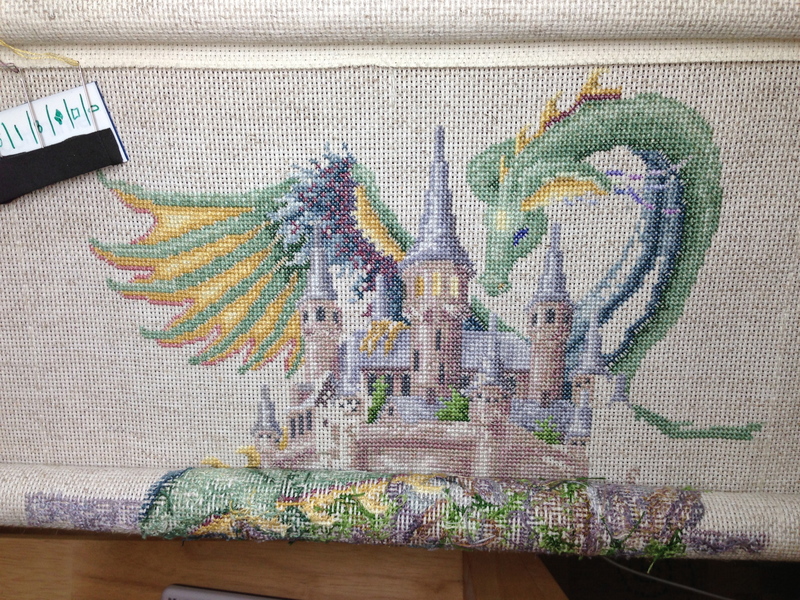 I am so close… Here is this week’s progress shot. I love this design, but will probably not attempt to do another T. Wentzler design again. Her designs involve combining of floss colors for virtually every symbol on the chart, which means a lot more tedious work is involved. The shading effect is beautiful, but ultimately not really worth it in my opinion. Ohhhhh! You know how I love dragons! If anything could entice me to try cross stitch again this might be it. Love it!!! And you are so resourceful. Pretty sure I would! I would need a magnifying glass for my magnifying glass, LOL! Deborah, It’s looking great! Congratulations in advance on your finish! Also, your frame setup looks like it’s working quite nicely… comfort whilst stitching is truly key, especially with a challenging piece. 😉 Well done! Hi Teresa. I have cross stitched that same dragon pattern. It turned out beautifully! So many different colors. I did it for my husband and he loved it!